Many of the new citizens of Blogville may not know that Linda from Da Weenies and Ann from Zoolatry jointly keep track of our furiends who have traveled OTRB. Once a month a new post is on that blog site. Contact information is below. 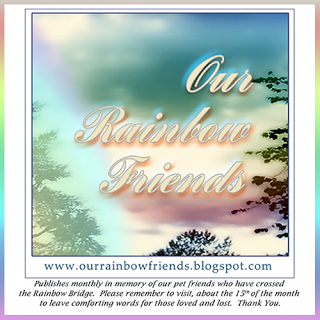 Ann writes: I want to take a moment today to remind all pet bloggers about a very special blog, OUR RAINBOW FRIENDS. This blog publishes once a month, usually about mid-month, in memory of all our pet friends who have crossed their Rainbow Bridge. It has been publishing now since January of 2012 ~ becoming a permanent memorial for so many beloved pets. With many bloggers leaving the community of blogging for Facebook and other social media, participation and comments have noticeably declined. This is unfortunate as our pets deserve better. We encourage everyone to consider "following" this blog, so you will not miss the publishing date, and be able to leave words of comfort for those who have crossed the bridge. As members of this caring community ~ this is little to ask for. Also, when you become aware of any pet who has crossed the bridge, please let us know (it need not be your own pet) by sending an email to: our rainbow friends at gmail dot com. We can then reach out to the pet owner for information and be able to include their pet on the monthly blog. Thank you for remembering and thank you for caring. I follow that site. It's nice to know someone remembers our Angels! Thank you, this is an important site for everyone to pay tribute to those who have left us. If you make a badge for it we can put a badge with link on the sidebar of this blog. I have put up a link for them and now follow on blogger. Everyone wishes to know they are remembered with love. I've been reading blogs for a number of years now, and you're right about bloggers that have left - Where did they go? But this is one of the most special ones that there is, and as I've told you before, it's truly a work of love. Thank-you!